Let’s Declare War on Collateral! 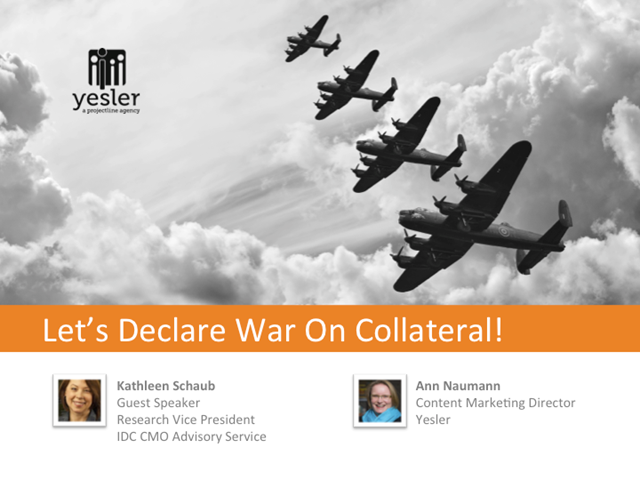 In this webcast, guest speaker Kathleen Schaub, Research Vice President for the IDC CMO Advisory Service, and Ann Naumann, Content Marketing Director for Yesler, a B2B marketing agency, discuss the many crucial roles content plays in today’s buyer-centric world and why so much content falls so far short of its goals. We’ll also talk about how to prove the value of content to a CMO and what steps organizations can take to improve their own content marketing practices. Everyone talks about sales enablement, but what does it really mean? In this webinar, we’ll dive into the prerequisites for true sales enablement, from technology to best practices, and then focus on how B2B marketers can help their sales counterparts become sales super heroes. Finally, we’ll provide guidance on how to measure and fine-tune the effectiveness of your sales enablement initiatives. Join Yesler CMO Tyson Roberts, a 15-year sales veteran, for actionable insight and advice on how to bridge the divide between marketing and sales. Find out how you can get the more from your B2B content marketing! In this webinar, we’ll review the 4 Ps for B2B marketing success – purpose, process, promotion, and practice. You’ll learn how to craft a winning content marketing strategy; how to streamline your content marketing production process so that it runs like a well-oiled machine; how to promote your content through paid, earned, and owned channels; and how to measure and improve on your results. Today’s empowered B2B buyers expect marketers to provide them with rich, relevant content that meets them exactly where they are at in their buying cycle. But how do you know who to target, when to engage, what to deliver, and how to reach them? Yesler is a B2B marketing agency that helps technology companies deliver predictable revenues, sustainable growth, and measurable results. Our webinars are designed to provide marketers with hands-on information to help them get more out of their marketing. Title: Let’s Declare War on Collateral!